Think of baked potatoes as nature’s mini casseroles: an edible dish that can hold up to a hearty stuffing. Russets have just the right balance to make a perfect twice-baked potato: enough starch to keep its structure, enough moisture to endure the double cooking. 3. Carefully cut off the top third of the cooked potatoes. Scoop the insides out into a bowl. Place the potato shells in a small baking dish. Add 1/2 cup Cheddar, sour cream, salt and pepper to the potato insides and mash with a fork or potato masher. Add scallions and the potato mixture to the beans and paneer; stir to combine. 4. 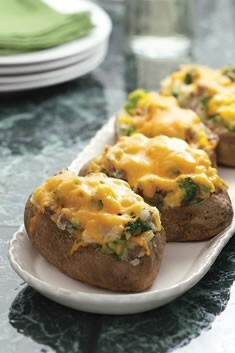 Evenly divide the potato mixture among the potato shells and top with the remaining 1/2 cup cheese. Microwave on high until the filling is hot and the cheese is melted, 2 to 4 minutes. Top it off with scallions. Add coriander chutney on top to make it different. Vegetarian variation: You can replace the paneer with a ground meat of any kind.